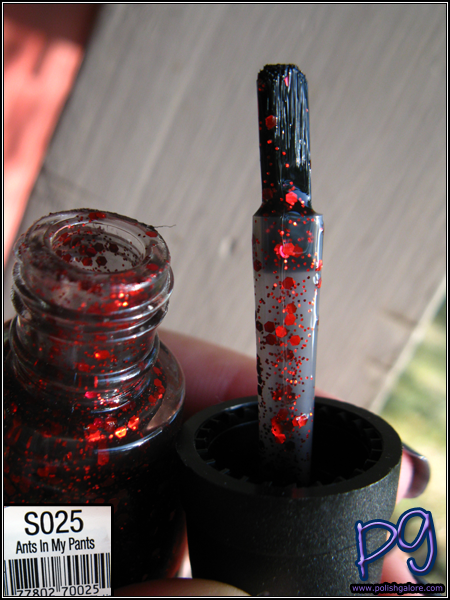 I have a lot of nail polish right now, so I try to stay away from the stores but when I saw what looked a bit like deborah lippmann Ruby Red Slippers, I had to grab a bottle. Spoiled by Wet n Wild is a CVS-exclusive line of nail polish - 72 colors in all & all Big-3 free. They sell for about $2 for a 0.50 fl oz bottle. The first thing that caught me was the brush. It's wide and flat which helps me sometimes in painting but I know it's not for everyone. This is Ants In My Pants, and I decided to test it out several ways. 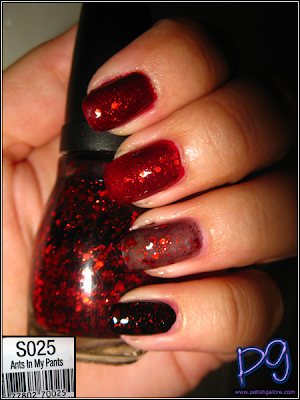 On my index and middle fingers I have on China Glaze Adventure Red-y, then 2 cots of Ants in My Pants. My ring finger is just 3 coats of Ants by itself. My pinkie is 2 coats of Ants over 1 coat of Sephora black. As you can see, Ants In My Pants is a large and small red glitter in a slightly black base. I did not use a top coat. I'm not sure if I like it over red or black better but I definitely do not care for this color by itself (ring finger). It's just too sheer and I can't justify more than 3 coats, even if it is a $2 bottle of polish. Here in the shade, I really think I love this color over red the best. 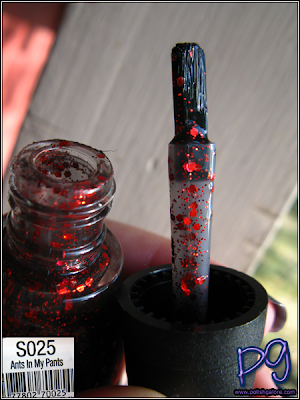 It really gives it a blood-red feel - great for Halloween! Here's a shot in indirect sun. Still loving it over red the best. I used to only wear glitters over black but you just lose so much. Finally indoors with the flash. Additionally, here's a close up of the different layering options. For $2, this really isn't a bad deal. 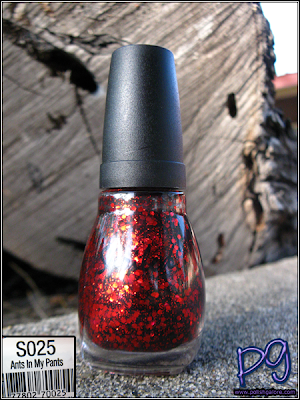 It's not a dead on dupe for the Ruby Red Slippers - there is a lot less glitter on the nail - it's a good alternative in a pitch. Only real hassle is because this only sold at CVS, you have to live near one. Spoiled by Wet n Wild is a CVS-exclusive line of nail polish sold for $2 for a 0.50 fl oz bottle. 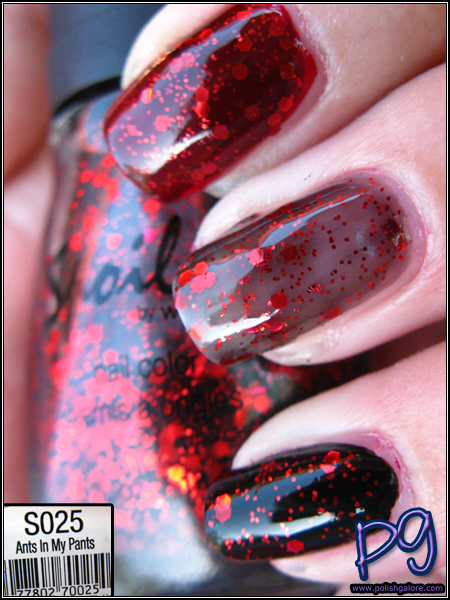 This is such a cool polish, I love it! Can't wait to see this is my local CVS (sting Long's Drugs in Hawaii). Ooh nice! Should be, I'd hope! This looks great on you! I got the DL version when I first got into collecting polish (I'm a DL hoarder) but it's nice to see a cheaper alternative! Oh yeah I have the DL version too - gotta love DL! That looks great over red. I wonder if we got different batches though. I have this and mine is very thick formula wise, but at 3 coats it's almost opaque and I had a lot more glitter coverage. Mine by Spoiled is also very different, it is black with lots of glitter in 3 coats. Maybe you got an off bottle?